R2005, Patrick O'Connor. 36", M. Medium purple falls and standards. 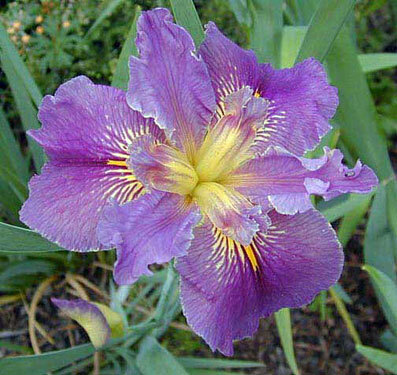 Showy thumbprint signal coarsely veined cream and purple, with yellow line in center. Lower half of styles cream, upper half red-purple. Loosely ruffled. False River x Shizuoka Sunrise. Originally registered as 'Chef Menteur' in 2003 but it was discovered that the name had been used in 1933. "Chef Menteur" literally means "chief liar" and is also the name given to a channel east of New Orleans that connects Lake Pontchartrain with Lake Borgne and the Gulf.